Dimensions: 53½"W x 25"D x 36½"
A stunning new furniture piece inspired by out best-selling Mesa Credenza. 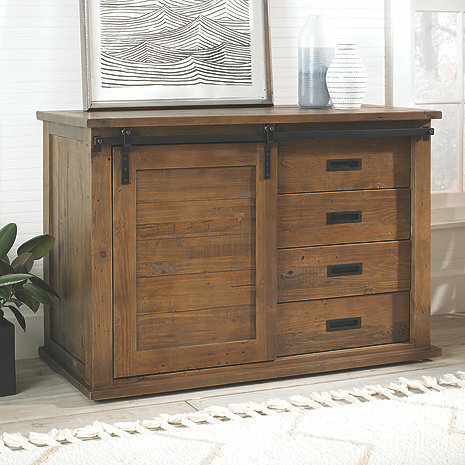 Handcrafted from rustic, reclaimed wood, our New Mesa Cabinet offer all the same exceptional details in a smaller size. The barn style door slides to reveal shelving for the storage and display of glassware and spirits on one side and 4 deep storage drawers on the other side. Shelf easily removes to store a small wine cellar for keeping wine at the perfect temperature close at hand. *Please note: No two units are exactly the same. Reclaimed wood may have some small imperfections and holes from the original nails. Will the Wine Enthusiast Silent 32 Bottle Dual Zone Touchscreen Wine Refrigerator fit in this cabinet? BEST ANSWER: I believe so. The shelf is removable, but you must also remove the back of the cabinet. It is screwed on and very easily removed. I would not want to purchase your available coolers with this piece. Therefore, what are the exact maximum height, width, and depth of a refrigerator this will accommodate? Want to be sure that the barn door will open and close without hitting the door handles of the fridge. Also, need to know that the barn door will open wide enough for the fridge doors to open completely to allow the trays to slide out unimpeded. I am envisioning a french door style refrigerator which will require the doors to open greater than 90 degrees. I am very interested in this piece but need to be sure I can find an adequate refrigerator that will function well with it. Thank you very much for your assistance! Does this require assembly or is it already assembled? BEST ANSWER: The Mesa Sliding Barn Door Cabinet comes fully assembled. If you decide to purchase the cabinet with a wine fridge then you will need to remove a section of the back of the unit to ensure there is enough ventilation for the wine fridge. Can you confirm the back panel only removes for the shelved section and not the entire back piece for both sections? BEST ANSWER: Yes confirmed only the shelved section when purchasing a wine cellar . I already sent one question. But a more direct question would be: What wine and beverage cooler do you have available that is an upgrade in quality and size that will function well with this credenza? If there are several options available that information would be greatly appreciated! Very nice cabinet, we put our own mini fridge in left side and use it as a grind and brew coffee station in our bedroom. Nice to conceal the fridge but still have access to clean cold water, store coffee and creamers. Wife loves it. Unit is very well made and looks just like the pictures. Very happy with it. Only small issue is drawers are a little stiff to close and must be fully closed to slide barn door. Also do yourself a favor and place little brown felt pads to eliminate the noise of opening and closing the sliding door. It’s fits perfeyin my man cave. Only thing missing is a wine shelf. They do not offer a wine shelf for this cabinet and I had to buy one online.